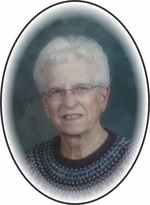 Thibault- Therese Marie Anna (nee Fontaine) formally of Tway, SK, passed away peacefully with her family by her side at age of 90, on January 5, 2019 at Oliver Lodge Saskatoon, SK. Therese was born to Ludger and Eva Fontaine in Prud’homme, SK. Therese went to school in Prud’homme. As a young woman Therese worked several different jobs. She was secretary for Monseigneur Baudoux in Prud’homme, she worked as a nurse’s aid in Cudworth, and as a nanny in Prince Albert where she met the love of her life Robert. They made their home on the family farm, where they raised their three children. Therese enjoyed sewing, cooking, gardening, traveling, volunteering, and entertaining family and friends. Her greatest joy was spending time with her grandchildren and great grandchildren. She especially loved the babies. Therese is lovingly remembered by her children: Adrien (Colette) of Tway, SK, Bernadette (Brad) Nosterud of Moosomin, SK, Daniel (Jocelyne) of Tway, SK; her 10 grandchildren and 15 great grandchildren; her brother Lionel (Fernande) Fontaine of Prince Albert, SK; her sisters-in-law Therese Fontaine of Saskatoon, and Christine Thibault of Tway SK; as well as several nieces, nephews, relatives and friends. The Mass of Christian Burial will be celebrated at the St. Theresa Roman Catholic church in Wakaw, SK on Saturday January 12, 2019 at 10:30 a.m. with Rev. Fr. Matthew Nguyen as celebrant. Interment will to follow at the Bonne Madone Cemetery. 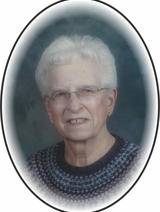 Donations in memory of Therese may be directed to the Bonne Madone Cemetery Fund. Funeral arrangements have been entrusted to Marc Blondeau of Kushneryk Funeral Service, Wakaw, SK, 306-233-4403. To send flowers to the family of Therese Marie Anna Thibault, please visit our Heartfelt Sympathies Store.